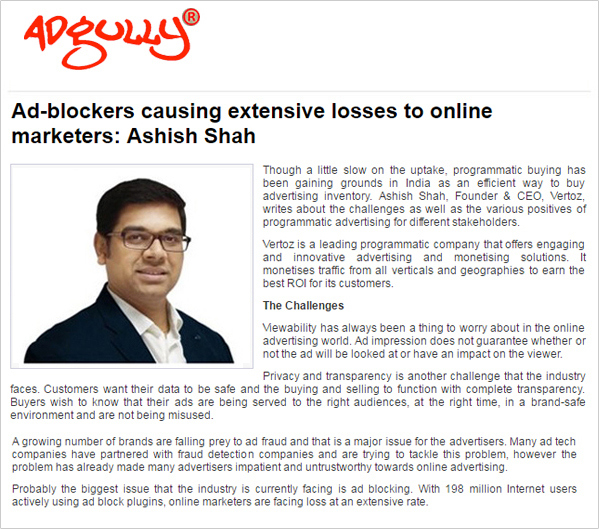 In an open interview with Adgully our CEO, Ashish Shah stated, “Ad-blockers causing extensive losses to online marketers”. India is evolving into a unique programmatic world. Programmatic buying has been gaining motion in India as an efficient way to buy advertising inventory. Ashish Shah, Founder & CEO, Vertoz, writes about the challenges as well as the various positives of programmatic advertising for different stakeholders. He explains about ad-blocking and how it is a vital threat for this industry. One of the major benefits of online advertising is that it is more cost effective than traditional channels and helps advertisers to save a lot of money. Adgully is the branch of journalism that tracks, records, analyzes and interprets the latest news happening around media, marketing and advertising. Their editorial team covers news and feature articles about people, places and issues related to the field of media, marketing and advertising. They bring out the crisp news with a fresh perspective. Vertoz is a leading programmatic company that offers engaging and innovative advertising and monetization solutions. Our ingenious platform, proprietary technology and advanced capabilities empower a global roster of top advertisers and publishers all under one roof. We monetize traffic from all verticals and geographies to ensure the best ROI for our customers. Our high flying traits include premium traffic quality, precise targeting, real-time tracking and detailed analytics.